If you enjoy strolling as you learn history … this is a terrific evening experience. The Evening Stroll & Eiffel Tower ticket experience is a 3-hour walking tour that will cover everything from Notre Dame to the iconic Eiffel Tower as a grand finale. Your guide will host you on a fascinating tour of Paris as you wander through streets and see beautiful monuments and they come to life in the evening twilight. Enjoy the walk as you make your way to the Eiffel Tower where you will have fast track access on the tower to enjoy the view of the City of Light. Please note summit tickets are not guaranteed on this tour and are only guaranteed at time of reservation. 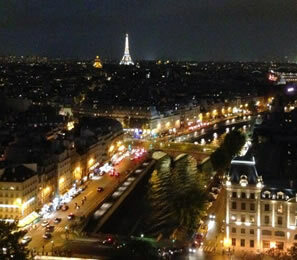 The Evening Stroll and Eiffel Tower ticket prices from €54.00 per person.